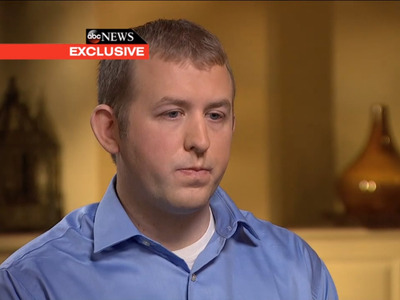 ABC NewsDarren Wilson sits for an interview on ABC. One of the most troubling things about Darren Wilson’s interview with George Stephanopoulos that aired on ABC News this week was his denial of racial tensions in Ferguson, Missouri. Wilson, who shot and killed unarmed black teenager Michael Brown in the St. Louis suburb in August, spoke publicly about the incident for the first time this week after a grand jury failed to indict him. As The Atlantic points out, Wilson responded Stephanopoulos’ questions with virtually no emotion. He said that although he never wanted to take someone’s life, he did his job properly. Wilson does not think he’s responsible for Brown’s death in the sense that he said the shooting was the only possible outcome of Brown’s actions. He insisted the situation would have unfolded the same way if Brown had been white. He then went on to deny racial tension even exists in Ferguson. Even more, he implied that police officers in general aren’t ever racist. Stephanopoulos: What were the relations like in that community every single day as you were working? … Did you feel any kind of racial tension there? Wilson: No. Ferguson loves Ferguson. That community loves its community. When people say it’s a diverse community, it is a diverse community. That is a very proactive community. Stephanopoulos: But the police force is overwhelmingly white and the community is predominantly African-American. That didn’t create tension? Stephanopoulos: Have you ever had any kind of a racial incident? Stephanopoulos: And never been accused of acting in a racist manner? Wilson’s statements stand in stark contrast to the reality in and around St. Louis, which is one of the most racially segregated cities in America. In addition to all of that, while two-thirds of Ferguson’s residents are black, as of August, the city’s police department only had three black officers out of 53, and most of the top city officials are white. St. Louis and Ferguson might be “diverse” in the sense that they aren’t 100% white, but that doesn’t mean there isn’t segregation and racial tension. There are varying witness accounts of what happened during the altercation that led to Wilson shooting Brown. Wilson has said that he feared for his life because Brown was attacking him, hitting him, and seemed to be undeterred by Wilson’s threats to shoot if Brown didn’t back off. But even if Wilson’s version of events is completely accurate, his description of Brown could be seen as racist. In his grand jury testimony, Wilson described Brown’s demeanor during the altercation, saying: “It looks like a demon; that’s how angry he looked.” Even assuming that the use of the inhuman pronoun “it” was unintentional, using the word “demon” to describe Brown is reminiscent of racist language from the past. Another part of Wilson’s testimony that stands out is his comparison of Brown to Hulk Hogan and his description of Brown charging at him through bullets as Wilson was firing. Bouie points out that in the Rodney King trial in the 1990s, jurors heard descriptions of King as “a ‘Tasmanian devil’ and a man with ‘hulk-like strength. '” Studies have shown that these stereotypes are attributed to blacks more than any other group, Slate notes. It all goes to show that racism can be deeply entrenched and implicit. Just because Wilson might not have noticed racial tension in Ferguson doesn’t mean it doesn’t exist.